Professor Adetokunbo Babatunde Sofoluwe, the Vice Chancellor of the University of Lagos (UNILAG) has died early this morning. His sudden death comes as a shock to the entire university community as the late VC showed no sign of ill health. Reports say that the Vice Chancellor collapsed during a meeting on Friday (Yesterday). He was then rushed to the University’s medical centre but shortly after transfered to the Lagos University Teaching Hospital, (LUTH) due to the severity of his condition. He died early Saturday morning, after suffering a suspected cardiac arrest while asleep. An academic staff of the university who plead anonymity, looking visibly disturbed confirmed the sad news. Some students in the University confirmed seeing Sofoluwe been hurriedly taken to UNILAG’s medical center late last night while others say they observed blood in his mouth. The sad news of his sudden death was also carried on micro-blogging site Twitter. Condolence messages have flooded social networking sites including Facebook and Twitter, where majority of people expressed shock and sympathy on Sofoluwe’s unexpected death. As at press time there has been no official statement concerning Prof. Sofoluwe’s untimely death from UNILAG. Professor Adetokunbo Babatunde Sofoluwe was appointed the 10th Vice-Chancellor of the University of Lagos with effect from 31st January, 2010. Professor Sofoluwe was born on April 15, 1950. 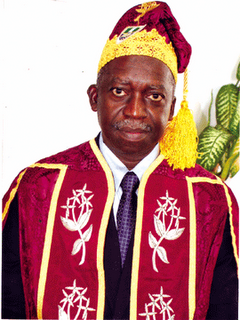 The Professor of Computer Sciences graduated with a Second Class Upper Division Honours in Special Mathematics in June 1973 from the University of Lagos. During his undergraduate years, he served the prestigious German Scholarship award for Academic Brilliance. He was a pioneer national Youth Corps member in the old South Eastern State of Nigeria. At the end of the youth Service, he won a Commonwealth Scholarship to Study at Edinburgh University, Scotland. He earned his Master’s Degree in 1975 and Doctorate in 1981 from Edinburgh University. The astute Scholar-Researcher started his teaching career as a Graduate Assistant at the University of Lagos in 1976 and rose steadily through the ranks to become a full Professor in October 1996. A versatile administrator, Professor Sofoluwe was a two-time Acting Head of the Department of Computer Science from 1989 to 1991 and 1994 to 1996. He served as Dean of the Faculty of Science between 1998 and 2002. Professor Sofoluwe was elected as a member of the Governing Council of the University of Lagos in 2000, for four years. By virtue of his appointment as Deputy Vice-Chancellor (Management Services), he returned to the Governing Council in August 30, 2006 and has been there till date. Prior to his appointment as Deputy Vice-Chancellor (Management Services), Professor Sofoluwe was the Director of Academics Planning Unit of the University. On June 6, 2010 he was honoured by CMS Grammar School Old Boys Association as a distinguished Grammarian. The erudite Scholar has authored and co-authored numerous academic books, manuscripts and articles in several reputable local and international journals. He has supervised several undergraduate and postgraduate projects, including those leading to the award of Doctorate Degrees. He has also acted as external examiner to other universities and institutions which include The Institute of Chartered Accountants of Nigeria, Yaba College of Technology, Obafemi Awolowo University, University of Agriculture, Abeokuta, Olabisi Onabanjo University, Ago-Iwoye, University of Ibadan, Federal University of Technology, Akure, University of Ado-Ekiti and University of Abuja. The Late Professor Sofoluwe enjoyed membership of several professional bodies. He was a Fellow of the Computer Association of Nigeria (COAN), a Fellow of the Computer Professionals of Nigeria (CPN), an Association Fellow of the Institute of Mathematics and Its Application (IMA) and a member of the Society for Individual and Applied Mathematics (SIAM). Professor Adetokunbo Babatunde Sofoluwe was the third alumnus to be appointed Vice-Chancellor of the University of Lagos. It’s so painful to hear of his demise. Wish I had a doleful lamentation ready. Bye sir! bravo d man tried dat is d type of ppl we wnt in nigeria not ppl like d norths dat notin gud coms from.only 2islamise,bomb,kill and destroy thier papa yash.How i wish with his gud once dat we hav heard,he also do for God inother 2inherit heaven.rip beloved.bcox dieing is not d isue. Eeeh, may his soul rest in perfect peace. The death of Professor Adetokunbo Babatunde Sofoluwe came to me as a rude shock. It is the saddest and the most terrible news I’ve ever heard since I became a man. For anyone who has personal relationship him will know that there can never be a replacement for him. He has assumed role of a father and a dependable menthol when to me. I wish he lives for another 62 years before he dies. The death of Professor Adetokunbo Babatunde Sofoluwe came to me as a rude shock. It is the saddest and the most terrible news I’ve ever heard since I became a man. For anyone who has personal relationship him will know that there can never be a replacement for him. He has assumed the role of a father and a dependable menthol in my life. I wish he lives for another 62 years before he dies. Rest in perfect peace Professor. The death of Professor Adetokunbo Babatunde Sofoluwe came to me as a rude shock. It is the saddest and the most terrible news I’ve ever heard since I became a man. For anyone who has personal relationship with him will know that there can never be a replacement for him. He had assumed the role of a father and a dependable menthol in my life since he attend my second PhD seminar where offered to be Internal Examiner. I wish he lives for another 62 years before he dies. Rest in perfect peace Professor. Its vry hard 2 bliv,nt @ dis time bt wat can I say dan MAY HIS SOUL REST IN PEACE. May the soul of the dead rest in perfect peace! May the gentle soul of this erudite and wonderful scholar rest in perfect peace. I condole with the authorities of the University of Lagos for the irreparable loss. RIP Prof.
We will missed U dearly, as U always have unique approach to solving problems . We pray that all your good legacy will reign supreme after U.